Set of 6 snow and sand peg with line and hook. The snow and sand pegs Hilleberg are made from hardened aluminum. 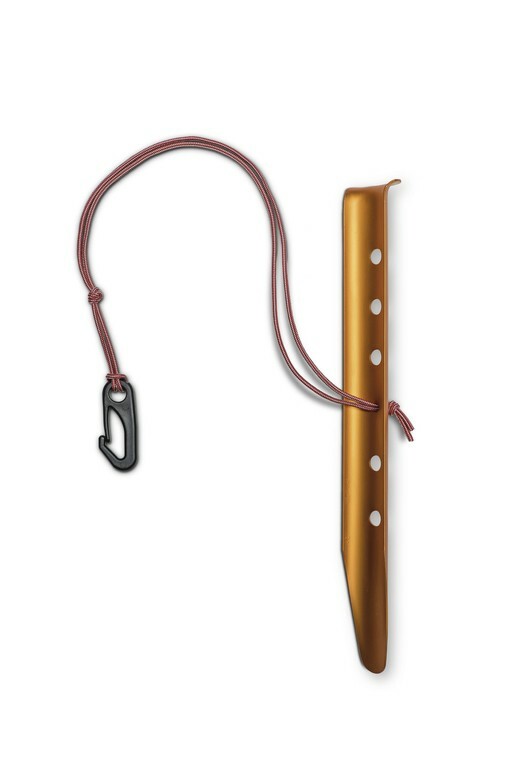 These anchors can safely attach a tent on soft ground. They are very light and robust. These snow and sand pegs are "dead weight" with a cord and a plastic hook. This system not to lose the anchor in the snow. Essential for winter camping (soft and hard snow), light and strong with a recognizable system in any condition. Stable on unstable ground Lightweight, tough and remarkably versatile, our Snow & Sand pegs are unique. After finding most so-called snow pegs to be too soft – they would bend in any but the fluffiest snow – we developed our own. Made from hardened aluminum, our Snow Pegs are built to withstand both very hard usage, including the inevitable contact with shovels, crampons and other winter gear, and very hard snow. At the same time, they are remarkably lightweight. The integrated line and hook gives you the flexibility either to bury the peg sideways in snow or sand, Deadman style, or to use it in a traditional, upright fashion. A carrying bag, made from our XP bag material (see Tent & Accessory Bags) is included.